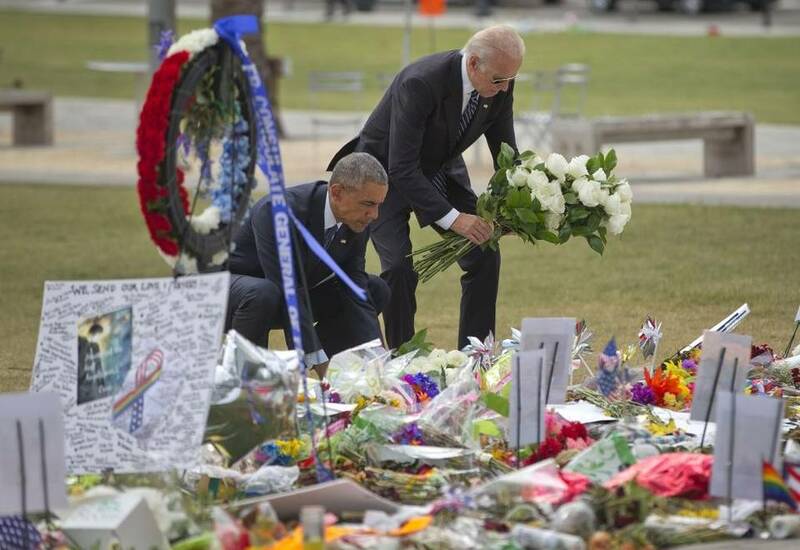 President Barack Obama and Vice President Joe Biden place flowers down during their visit to a memorial to the victims of the Pulse nightclub shooting, Thursday, June 16, 2016 in Orlando, Fla.
*President Obama arrived in Orlando, Fla. Thursday afternoon to meet with relatives of people killed in the shooting rampage as well as with survivors of the June 12 massacre. Obama was joined on the flight by two Florida lawmakers — Sen. Marco Rubio (R) and Rep. Corrine Brown (D) — while another, Sen. Bill Nelson (D), flew down with Vice President Biden, officials said. 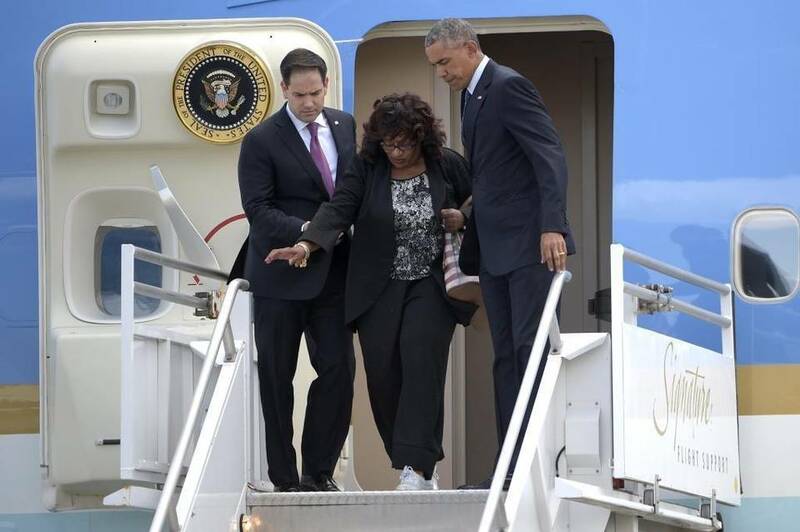 President Barack Obama, and Sen. Marco Rubio help U.S. Rep. Corrine Brown as they get off Air Force One at Orlando International Airport. Florida Gov. 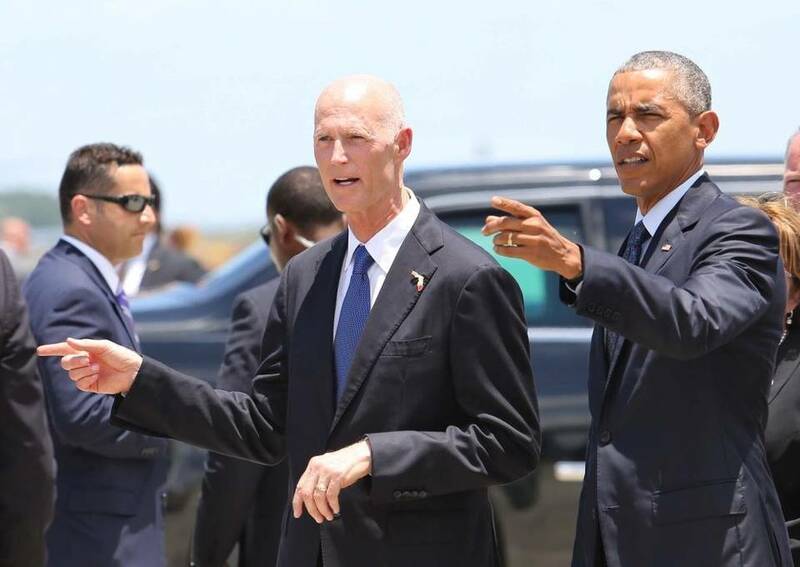 Rick Scott, left, walks with President Barack Obama on the tarmac during the president’s arrival at Orlando International Airport, Thursday, June 16, 2016. 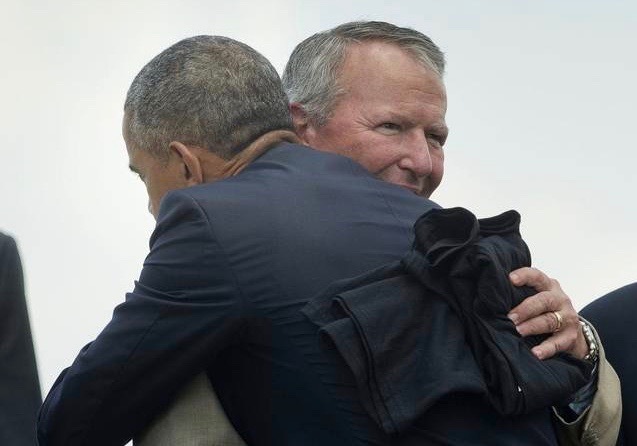 Upon arrival, Obama shook hands with Gov. Rick Scott (R), a fierce critic of the president who had recently noted that Obama hadn’t called him directly in the wake of the shootings, while former President George W. Bush and the current presumptive Republican nominee Donald Trump called immediately. 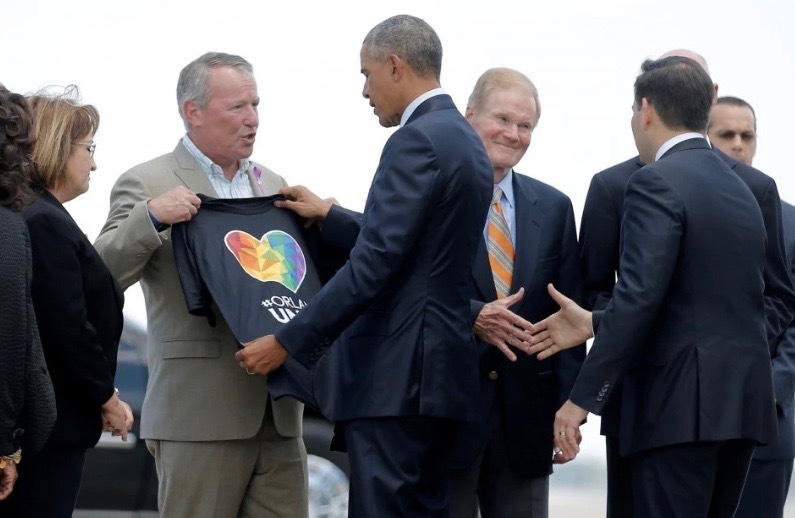 Obama also greeted Mayor Buddy Dyer (D), who presented POTUS with an “Orlando United” T-shirt. While laying flowers at a memorial downtown, about a mile and a half from the club where the shooting occurred, Obama said the city was “shaken by an evil, hateful act,” reports the Washington Post. Obama said that he and Vice President Biden met with the family members of people slain in the shooting, calling their grief indescribable. The visit was meant demonstrate that “Americans stand shoulder to shoulder” with Orlando, White House spokesman Eric Schultz told reporters during the flight. The shooting rampage early Sunday left 49 people dead and dozens more injured. Hours before Obama arrived, officials in Orlando said that nearly two dozen people injured in the shooting were still hospitalized, six of them in critical condition.